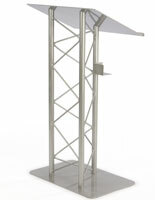 Looking for truss podiums to command audience attention at meetings or events? 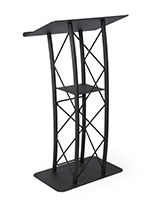 These elegant aluminum and steel wire lecterns have a unique, modern look based on simple lines and contemporary design. 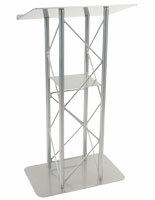 Metal truss podiums with square or round tubing construction differ from standard or traditional wood pulpits because of their unique construction. These fixtures are designed with sturdy aluminum or steel tube supports reinforced by welded wire support trusses. Available with curved or straight sides, these contemporary facility and church pulpits offer a very modern look that commands attention in any environment without sacrificing stability. Lightweight metal truss podiums for commercial and institutional use are also easily portable and easy to transport, making them a perfect choice for use as speaking furniture for both in-house and off-site events. This type of eye-catching, economical contemporary lectern will complement any environment, from traditional businesses to educational institutions, churches and other places of worship, conferences, promotional events and trade shows. 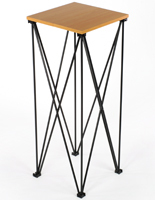 What options are available for welded wire and steel tubing lecterns? 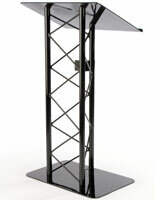 Metal truss podiums are among the most elegant speaking stands available, and feature straight or curved sides. 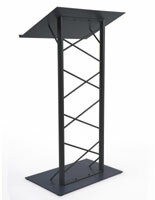 These high visibility speaking fixtures are available with or without accessory shelves for an even cleaner look. The angled wire steel trusses and aluminum bases not only provide built-in support for the construction, but give these steel wire lecterns an open feel. Pulpit designs supported by strong wire trusses with welded metal tubing supports can be constructed in a variety of geometric patterns. 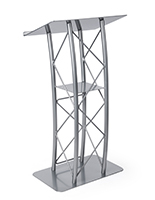 Single and double steel post lectern styles, as well as elegant triangular configurations combine stability with eye-catching design. 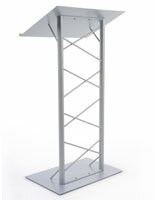 Wood top lecterns with openwork metal base stands are ideal for use at trade shows due to their easily portable design. This type of lightweight wood and steel or aluminum pulpit combines traditional and modern materials to create a strikingly modern fixture that will complement any decor. These pop-up accessory stands fold up easily for transport and storage. iPad podium mounts with metal enclosures finished to match the stand base are available on many models to enhance usability. This type of accessory is a great addition to conference or facility fixtures as well as pulpit stands for church or school use. 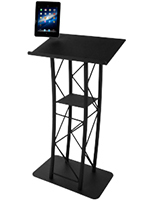 Schools and commercial businesses utilize tablet-enabled lecterns for everything from training and educational purposes to speeches, debates, and convocations. 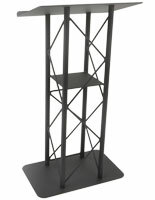 Powder coated finish is the standard for these truss podiums for three reasons: it applies easily, it lasts a long time, and it looks great. Neutral finish colors, shades of black, gray and silver are designed to complement any decor or environment. All the trusses and braces are spot welded in place for maximum durability. Strong welded joints ensure that openwork metal podiums and aluminum wire pulpits will last for many years despite repeated use by multiple speakers. Another advantage of these unique steel and aluminum pulpits is that the elegant yet reserved design that does not obstruct the speaker, allowing the audience or congregation to clearly focus attention on the message. 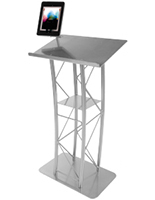 Many of our standard rectangular and triangular lecterns are produced using 100% aluminum. This enables the podiums to be very lightweight and easily transported without sacrificing stability. The reading surface is attached with recessed mounting screws for an even more seamless look. Many styles feature shelving and storage space that is built into the framework and welded in place for security. In addition, the minimalist design uses much less material than solid metal, wood, or acrylic options, making these podiums an economical, eco-friendly option. For this reason, a number of our metal lecterns are affordable alternatives to classic solid body designs made from more traditional materials.